1. Saves valuable desk space. 2. Adjusts effortlessly in all directions to provide ideal monitor positioning for different tasks or users. 3. Gas-spring height adjustment minimizes risk of back injury. 4. Die-cast aluminum frame structure creates unmatched stability. 5. Installs quickly and easily through grommets or onto desk edge. 6. Optional quick-release monitor bracket makes monitor mounting/dismounting a snap. 8. Environmentally-friendly: Made of 100% recycled aluminum and packaged in recycled paper products. The M7, winner of the prestigious Gold Award at NeoCon 2003, is the most easily adjustable, stable and elegant line of flat panel monitor arms on the market. Built to demanding specifications, any of the M7's countless configurations will allow users to take full advantage of the benefits of flat panel technology. And they're environmentally-friendly too, composed of 90% recycled materials. Take your pick. 10-year warranty on all gas-spring arms. Humanscale monitor arms are available in the following finishes. For exact color samples,contact your Humanscale representative. Silver monitor arms ship with a silver mount, base and arm, and a polished aluminum post. Every component of a black monitor arm is black. Every component of a polished aluminum monitor arm is polished aluminum. Please note this color selection requires extended lead times and a color up charge and is available only on M7 Monitor Arms. Bracket Styles are divided into three primary categories based on application: No-Post Brackets, Top-Mount Bracket and Bracket Mounts. No-Post Bracket: Are designed for vertical surfaces such as slatwall, panels or wall studs. They are available for one or two monitors. No-Post Brackets support monitor arms on vertical surfaces (slatwall, panels or wall studs) that do not require posts to raise the monitor higher than the mounting point. The N1 No-Post Bracket accommodates one monitor. N1 Brackets are only used with vertical surfaces, which include slatwall, systems furniture panels and wall studs. Different N1 Brackets are available for Slatwall, Panels or Wall Studs. Top Mount Brackets: Insert directly into a Post to support the Monitor Arm at a fixed position at the top of the Post. Top- Mount Brackets provide a continuous, clean look extending from the Post, and are an excellent choice when used with an M4 Adjustable Arm or M7 with FEA because the Bracket itself cannot be adjusted along the Post. T1 Top-Mount Brackets support an arm accommodating one monitor. Top- Mount Brackets are fixed at the top of the post and, unlike Bracket Mounts, do not adjust up and down the post. The Top-Mount Bracket is supported by a stem inserted into the top of a post. Top-Mounted Posts are 3.1" shorter than Bracket-Mounted Posts so the overall height will be approximately the same. This is because brackets can go no higher than the Post, but the Top-Mount Bracket adds 2.4" t the post height. Because the Top-Mount Bracket itself does not adjust up/down the post, it is typically used with an adjustable arm such as the M4, an Adjustable Standard Post or with an FEA. 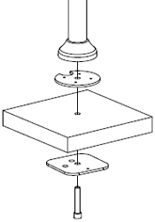 Top- Mounted Posts are generally used when dynamic adjustment is required while Bracket-Mounted Posts are most widely used in dedicated user environments where only static adjustment, or a "setting" is required to set the height to optimal position once, prior to usage. Top-Mounted Posts are only available with Standard Posts and Slim Posts. Stackable Posts cannot be Top-Mounted (Bracket Mounts only). 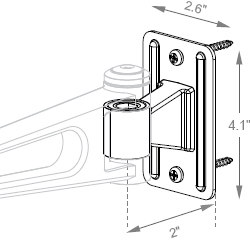 Top-Mount Brackets for Folding Links (Arm Styles 8 and 9) are 2.4" high. All other Arm Styles are 3.1". 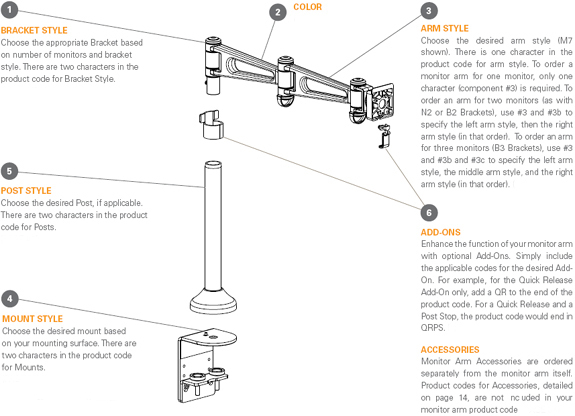 B1 Bracket-Mount monitor arms affix via a bracket that attaches around the post, allowing it to be vertically adjusted along the post (by tightening a lever) and secured in a range of positions to accommodate the ergonomic needs of a variety of users. Use Bracket Mounts when multiple monitors are required or when only static adjustment is required. Bracket Mounts secure to the post via a ratchet lever, which secures tightly around the post anywhere along the inner post (above the friction knob on Standard Posts and Horizontal Stackable Posts, anywhere along Slim and Vertical Stackable Posts). The B1 accommodates one monitor. Can add up to 2.5" to the overall length of all Bracket-Mounted Arms (except Ball Joint only, style 0) when bracket extends directly in front of Post. Bracket Mounts are not conducive to regular adjustments throughout the day, which may be required if different users share the same workstation. They are typically used in applications where only static adjustments (settings) are required. Use only row 3 for bracket styles supporting only one monitor (N1, T1 and B1). Ratchet levers are designed to tighten bracket around Post, even when the ratchet is up against a wall or other obstruction. Pulling the lever away from the bracket disengages the mechanism and allows the lever to free float and be positioned away from the obstruction so the bracket can be fully tightened. 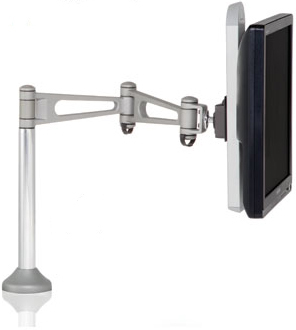 M7 Non-Adjustable Monitor Arm styles do not provide vertical adjustment, however, vertical adjustment may be achieved with Standard Adjustable Posts or FEAs. 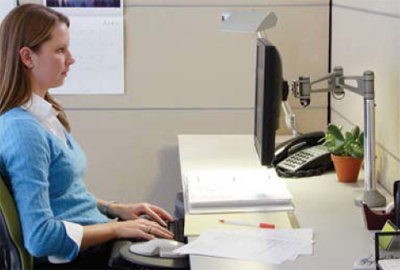 Non-Adjustable Monitor Arm styles are best suited for single user workstations that do not require frequent adjustments. Both Adjustable and Non-Adjustable Arms are available with all Bracket Styles (No Post Brackets, Top-Mount Brackets, and Bracket Mounts). The M7 Non-Adjustable No-Link Arm is appropriate for environments with mounting points in close proximity to the user. The M7 Non-Adjustable No-Link Arm is essentially a ball joint only and does not provide depth adjustment. It is suitable for applications in which an arm's length is not required to optimize viewing distance. The vertical center point of the monitor is 1.7" above the top of the Post (the center of the Top Mount). 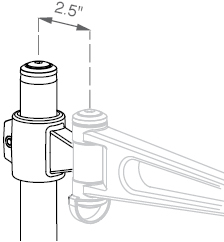 Vertical adjustments can be achieved with a Standard Adjustable Post or Front-End Adjustor (FEA). 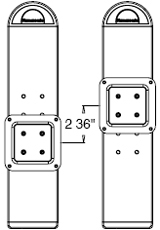 Add 2.5" to the length of all arm styles when Bracket-Mounted. The M7 Non-Adjustable Arm with One 8" Link is appropriate for environments with mounting points in close proximity to the user, but is somewhat longer than the No-Link Arm. The M7 Non-Adjustable Arm with One 8" Link is appropriate for environments requiring minimal depth adjustment. The M7 Non-Adjustable Arm with One 8" Link, like all Single-Link Arms, does not offer depth adjustment in front of the mounting point. Depth Adjustment is achieved by arcing the monitor to the right or left of the mounting point. 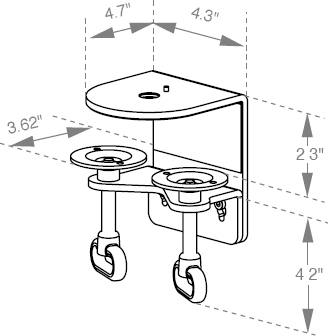 Can add up to 2.5" to the overall length of all Bracket-Mounted Arms (except Ball Joint only, style 0) when the bracket extends directly in front of Post. The M7 Non-Adjustable Arm with Two 8" Links incorporates two standard links for depth adjustment directly in front of the user. The M7 Non-Adjustable Arm with Two 8" Links enables monitor depth to be adjusted directly in front of the mounting point. 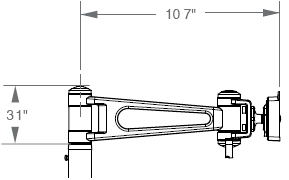 The M7 Non-Adjustable Arm with Two 8" Links provides 12.4" in front of the mounting point (from 6.3" to 18.7"). The M7 Non-Adjustable Arm with One 12" Link is appropriate for environments with mounting points in close proximity to the user, but is four inches longer than the Non-Adjustable Arm with One 8" Link. The M7 Non-Adjustable Arm with One 12" Link provides minimal depth adjustment. This arm moves the monitor to the left or right when adjusted in depth. The M7 Non-Adjustable Arm with one 12" Link, as all single link arms, does not offer depth adjustment in front of the mounting point. Depth adjustment is achieved by arcing the monitor to the right or left of the mounting point. Vertical adjustments can be achieved with an Adjustable Post or Front-End Adjustor (FEA). The M7 Non-Adjustable Arm with Two 12" Links incorporates two long links for depth adjustment and is used primarily when the mounting point is further from the user. The M7 Non-Adjustable Arm with Two 12" Links places the monitor 26.75" from the mounting point. It also enables dual monitors in a wide range of sizes (when used with N2 or B2 Bracket Mounts) to be positioned side-by-side and as close to the mounting point as possible. 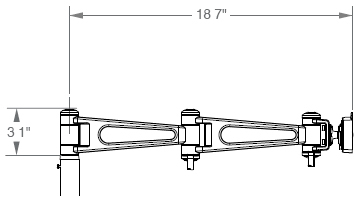 The M7 Non-Adjustable Arm with Two 12" Links provides 20.5" of length in front of the mounting point (from 6.3" to 26.75"). The M7 Non-Adjustable Arm with One 12" Link and One 8" Link provides ample depth adjustment with one standard and one long link. The M7 Non-Adjustable Arm with One 12" Link and One 8" Link is primarily used with dual monitors and narrow desks. The different arm lengths allow monitors to be positioned side-by-side as close to the mounting point as possible (farther away from user). The M7 Non-Adjustable Arm with one 12" Link and One 8" Link provides 16.4" of length in front of the mounting point (from 6.3" to 22.7"). The M7 Non-Adjustable Arm with One 8" Folding Link is appropriate for environments with mounting points in relatively close proximity to the user. The M7 Non-Adjustable Arm with One 8" Folding Link provides minimal depth adjustment. This arm moves the monitor to the left or right when adjusted in depth. The Folding Link provides cable management through the arm and has a bottom cover for easy installation or maintenance. The M7 Non-Adjustable Arm with Two 8" Folding Links incorporates two 8" links for depth adjustment. Monitor depth may be adjusted all the way to the mounting point. The M7 Non-Adjustable Arm with Two 8" Folding Links is appropriate for environments requiring depth adjustment directly in front of the mounting point. Because the top link folds over the bottom link, it also enables the monitor to be pushed all the way back to the mounting point. The Folding Links provide cable management through the arm and has a bottom cover for easy installation or maintenance. The M7 Non-Adjustable Arm with two 8" Folding Links provides 16.2" of length in front of the mounting point (from 2.5" to 18.7"). Because the Folding Links are positioned above one another, the center point of the monitor is 4.25" above the top of the Post. Are used to mount posts to horizontal surfaces such as desks, counters, tabletops and other work surfaces. The Bolt-Through Mount uses an undersurface plate and heavy-duty bolt to support the monitor arm post on a horizontal surface.. The Bolt-Through Mount is the best option for heavy monitors or multiple-monitor environments because it offers the most stability to the Post. The Bolt-Through Mount works with all Post styles with exception of the Standard Post, Adjustable, for Grommet Mounts. 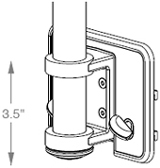 The Bolt-Through Mount may be used in any round hole that is 5/8" to 3" in diameter, or in a square/rectangular hole in which at least one side is a minimum of 5/8" and no greater than 2 1/2" in length. This includes drilled holes or existing grommet holes. The supplied bolt supports the post on surfaces up to 1.5" thick. For thicker desks requiring a longer bolt, call your Humanscale sales Representative. 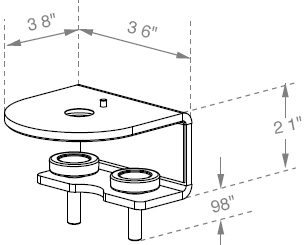 Three holes in the undersurface plate of the Bolt-Through Mount accommodate any grommet hole placement relative to an undersurface obstruction, such as an end panel or wall. The plate can be rotated to shorten the amount of plate that extends beyond the grommet hole. 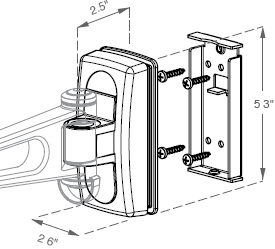 The maximum allowable weight load of the Bolt-Through Mount exceeds the allowable weight load for all posts. Refer to the Post section, page 42, for applicable weight loads. 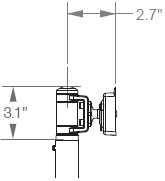 When specified with an Adjustable Post, Bolt-Through Mounts provide 3.5" of dynamic height adjustment. Cable management provided through the post base and undersurface plate, when used with a grommet hole of at least 2.0", depicting the amount of access with four different grommet hole sizes. The Bolt-Through Mount can be ordered separately as an Accessory. Order separately if customer prefers to add the Bolt-Through option to the work station along with any other Horizontal Surface Mount (for example, in addition to a clamp mount to determine the most suitable mount for workstation). The Heavy-Duty Clamp Mount is a two-piece surface clamp that supports the monitor arm post on horizontal surfaces. The Heavy-Duty Clamp Mount accommodates heavy or multiple monitors with Standard or Stackable Post styles. The Heavy-Duty Clamp Mount accommodates horizontal surfaces ranging from 0.63" to 2.32" in thickness. The maximum allowable weight load of the Heavy-Duty Clamp Mount exceeds the allowable weight load for all posts. The Heavy Duty Clamp Mount can be installed on a work surface with a minimum 0.5" clearance between the back of the work surface and a wall or panel. This is accomplished by separating the two clamp pieces, sliding the rear of the top portion between the surface and panel, and connecting the bottom portion from the underside of the surface. 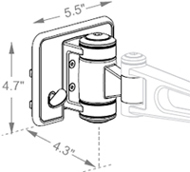 With the exception of the Grommet Mount, all Horizontal Surface Mounts provide 3.5" dynamic height adjustment when specified with a Standard Adjustable Post. 180˚ Post Stop is recommended for use in conjunction with all clamp mounts to prevent the arm from swiveling away from the desktop. The Heavy-Duty Clamp Mount is required for multiple monitor environments requiring a clamp solution in which the total monitor weight exceeds 30 pounds. The Low-Profile Two-Piece Clamp Mount is a two-piece surface clamp that supports the monitor arm post on horizontal surfaces. The Low-Profile Two-Piece Clamp Mount is designed to accommodate standard monitors, weighing a combined 30 pounds or less, with Standard and Slim Post styles only. Three different installation options enable the Low-Profile Two-Piece Clamp Mount to accommodate horizontal surfaces ranging from 0.31" to 2.76" in thickness. The Low-Profile Two-Piece Clamp Mount allows installation to panel-hung work surfaces without the need to demount the surface. This is accomplished by separating the bottom portion of the clamp from the top portion, allowing the rear of the top clamp portion to slide between the surface and panel. The bottom portion can then connect from the underside of the surface. 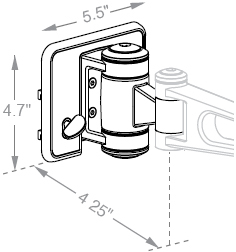 With the exception of the Grommet Mount, all Horizontal Surface Mounts provide 3.5" dynamic height adjustment when specified with an adjustable post. A 180˚ Post Stop is recommended for use in conjunction with all Clamp Mounts to prevent the arm from swiveling away from the desktop. The Low-Profile One-Piece Clamp Mount is a one-piece surface clamp that supports the monitor arm post on horizontal surfaces. The Low-Profile One-Piece Clamp Mount is designed to accommodate only one monitor up to 20 pounds, with Standard and Slim Post styles only. 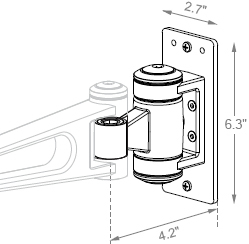 The Low-Profile One-Piece Clamp Mount may be used on horizontal surfaces up to 1.29" in thickness and is designed for environments permitting minimal space for a clamp or when visual aesthetics require the clamp to be as unobtrusive as possible (for example, facing an office entrance). Panel-hung work surfaces must be demounted to enable installation of the Low-Profile One-Piece Clamp Mount. The Direct Mount screws directly into the top of solid wood horizontal surfaces to support the monitor arm post. The Direct Mount is appropriate for environments providing limited or no access to the underside of the work surface. It is designed for use with Standard, Stackable or Slim post styles. 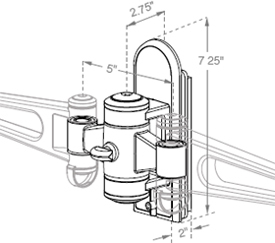 The maximum allowable weight load of the Direct Mount exceeds the allowable weight load for all posts. 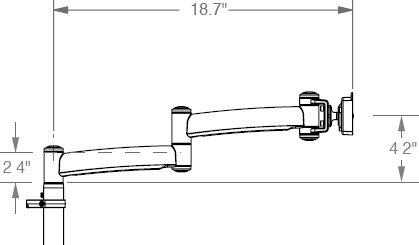 Enable monitor arms to be affixed vertically to walls such as slatwall, panels or wall studs, and may or may not support a post, depending on style. There are three styles of Vertical Surface Mounts: Slatwall Mounts, Panel Mounts and Wall Stud Mounts. 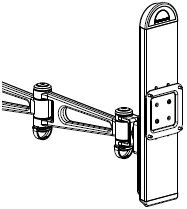 There are two styles of Slatwall Mounts: Standard Slatwall Mounts (support single or multiple monitors and/or posts to mount monitors higher than mounting point) and Universal Slatwall Mounts (compatible with numerous slatwall systems to support one monitor only; not compatible with posts). Humanscale offers three Post styles to accommodate a range of requirements. There are three different Post Styles: Standard Posts, Slim Posts and Stackable Posts. Standard Posts are comprised of a large outer tube and narrow inner pole and are appropriate for heavy-duty applications such as workstations requiring multiple monitors. They may be adjustable or non-adjustable in height, and are available only in one-row configurations. 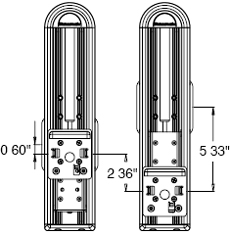 Standard Posts are comprised of a large outer tube and narrow inner pole that extends above the outer tube. Standard Posts also feature a friction knob that is used to apply varying degrees of friction against the inner pole to accommodate heavier monitors when used with Adjustable Posts. Standard Posts are designed primarily for use with heavy monitors and multiple-monitor configurations. They are compatible only with Horizontal Surface Mounts. The height of the Post is dependant on the bracket. When combined with a Top-Mount Bracket, the Standard Post will be 3.1" shorter than when used with a Bracket-Mounted Arm. This is because Top-Mounted Arms provide an extension of the post itself. Standard Posts accommodate a total weight load of up to 60 pounds, with a maximum of 30 pounds per monitor or 20 pounds per monitor when used in conjunction with three monitors using a B3 Bracket. Standard Posts may be ordered in Adjustable and Non-Adjustable styles. 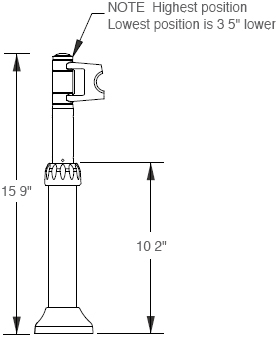 Non-Adjustable Standard Posts are specified with an SP code. Adjustable Standard Posts are specified using the monitor's diagonal dimensions in inches (15,17, 19, 21 or 23). 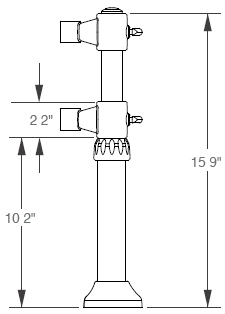 Use the diagonal monitor measurement only as a guideline when specifying Standard Adjustable Posts. Actual monitor weight should be used whenever possible to determine the most appropriate Adjustable Post for a particular monitor. When specified with the Adjustable Standard Post, Grommet Mounts provide 8" of dynamic height adjustment; all other mounts provide 3.5" of dynamic height adjustment. Both Adjustable and Non-Adjustable Posts used in conjunction with Grommet Mounts also provide 9" of static adjustment, allowing the post height to range from 8" to 17" (not including 8" of dynamic adjustment), depending on the position in which the post is attached to the Grommet Mount. Adjustable Standard Posts utilize a friction knob to provide additional friction for heavier monitors. The friction knob can also lock the post into position to prevent height adjustment. Slim Posts are appropriate for lightweight applications such as workstations requiring only one or two smaller monitors. The diameter of the Slim Post is the same for the entire length of the post making it easy to adjust B1 or B2 brackets anywhere along the post height. Slim Posts accommodate a total weight load of 30 pounds for one monitor or 15 pounds per monitor when supporting two monitors using a B2 Bracket. The height of the Slim Post is dependant on the bracket. When combined with a Top-Mount Bracket, the Standard Post will be 3.1" shorter than when used with a Bracket-Mounted Arm. This is because Top-Mounted Arms provide an extension of the post itself. Slim Posts are not height-adjustable, but vertical adjustments can be achieved with an M4 Adjustable Arm or a Front-End Adjustor (FEA). Stackable Posts support up to two rows of one to three monitors per row. Stackable Posts can also be used to raise the position of a single arm (for example, one monitor positioned 30" above the surface). Stackable Posts are available for both horizontal and vertical surfaces. Stackable Posts are the only solution available for Vertical Mounting Surfaces. Stackable Posts for Horizontal Surfaces are used with monitor arms that are mounted to horizontal surfaces such as desks, counters, and tabletops. Stackable Posts for Horizontal Surfaces enable up to two posts to be configured together to mount multiple monitors vertically on horizontal surfaces such as desks, counters, and tabletops. The first row Post is comprised of a large outer tube and narrow inner pole. The second row (Top Row) consists of an inner pole only. requiring two or three vertical levels of monitors or one monitor to be mounted in a high position (on second level). Stackable Posts for Horizontal Surfaces may only be used on horizontal surfaces using a limited number of Horizontal Surface Mounts: Bolt-Through Mount, Heavy-Duty Clamp Mount and Direct Mount. Stackable Posts may only be used with Bracket-Mounted Arms (B1, B2 or B3). They are not compatible with Top-Mount Arm styles. Stackable Posts accommodate a total weight load of 60 pounds for the first row and 45 pounds for the Top Row, with a maximum total weight of 90 pounds for a Two-Row Stackable Post. Up to three monitors may be displayed via Bracket-Mounted Arms depending on the weight of the monitor. Up to six monitors on two rows (three monitors per row) may be displayed on a Two-Row Stackable Post. Select a 2H Two-Row Stackable Post to specify both a bottom and top row. If only one row is required, order a 1H One-Row Stackable Post. The One-Row Stackable Post should be specified if a second row may be required at some time in the future. To order a second row to combine with an existing 1H, order a TH Top-Row Stackable Post for Horizontal Surfaces. The arm for the top row should be specified with the Post from the M7 and M4. When ordering a Stackable Post for Horizontal Surfaces with No Mount, be sure the Mount is ordered as an XH as it is different from the XV No Mount Stackable Post for Vertical Surfaces. Stackable Posts with No Mount may be required for desks with built-in mounting systems. Three rows of monitors may be supported by Stackable Posts providing the monitors fit into the vertical space provided. Two-Row Stackable Posts for Horizontal Surfaces provide 24.8" of post height above the friction knob to enable three rows of Bracket-Mounted arms supporting monitors 12" in height or up to 15" in height with use of FEAs. Additionally, first row monitor can be lowered up to 5.4" using a Drop-Down VESA Plate. This will allow support of three monitors vertically up to 12" high. Stackable Posts for Vertical Surfaces are used with monitor arms that are mounted to vertical surfaces such as slatwall, panel systems, or wall studs. Stackable Posts for Vertical Surfaces enable up to two posts to be configured together to mount multiple monitors vertically. They are used only with vertical surfaces such as slatwall or wall studs. Stackable Posts for Vertical Surfaces are designed for environments requiring two or three vertical levels of monitors, or requiring one monitor to be mounted in a high position. Stackable Posts for Vertical Surfaces may only be used in conjunction with Standard Slatwall Mounts and Standard Wall Stud Mounts. Stackable Posts are not compatible with Panel Mounts. Stackable Posts for Vertical Surfaces are 1.3" in diameter the entire length of the post. This allows Bracket Mounted Arms to be positioned anywhere along the two posts. Select a 2V Two-Row Stackable Post to specify both the bottom and top row. If only one row is required, order a 1V One-Row Stackable Post. The One- Row Stackable Post should be specified if a second row may be required at some time in the future. To order a second row to add to an existing 1V, select a TV Top-Row Stackable Post for Horizontal Surfaces. 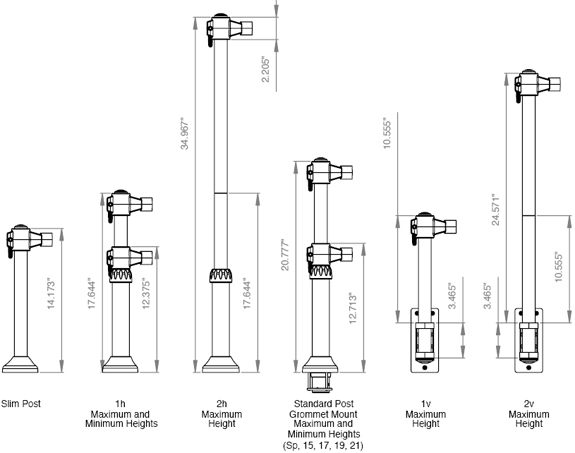 When ordering a Stackable Post for Vertical Surfaces with No Mount, be sure the Mount is ordered as an XV as it is different from the XH No Mount Stackable Post for Horizontal Surfaces. Stackable Posts with No Mount may be required for desks with built-in mounting systems. 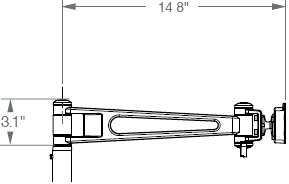 Adjustor or FEA is an attachment that provides up to 6" of dynamic height adjustment. It also has static settings that allow up to 5.33" of static adjustment. FEAs provide additional vertical static and/or dynamic height adjustment of the monitor. They are appropriate for a wide range of applications, including multi-user workstations and environments in which the monitor must be higher than the arm that supports it. FEAs are ordered according to the weight of the monitor with which they will be used. The monitor sizes in the description are basic guidelines only. It is important to note that not all 30" monitors are under 25 lbs. For 30" monitors confirming the monitor weight is a requirement of specifying an FEA. 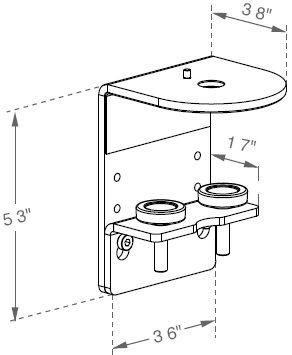 Both the bracket on the front of the FEA that attaches to the monitor and the bracket on the rear of the FEA that attaches to the monitor arm (ball joint) have three vertical mounting options that allow up to 5.3" of static adjustment. 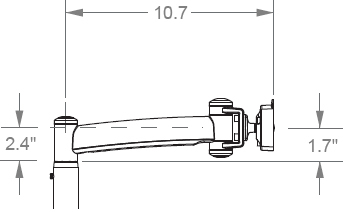 The monitor can be positioned as low as .6" above the center of the monitor arm (ball joint) and as high as 5.3" above the center of the arm based on which sets of holes are used to mount the FEA both to the arm and the monitor. 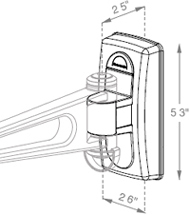 The adjustable cylinder then allows 6" of dynamic adjustment downward from that position. 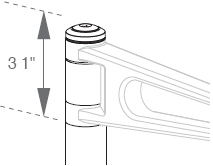 The FEA's adjustable cylinder provides 5.5" of dynamic adjustment. It is important to note that the FEA provides downward dynamic adjustability up to 6". The static adjustment raises the monitor, relative to the Monitor Arm, by up to 5.2". Use the diagonal monitor measurement only as a guideline when specifying FEAs. Actual monitor weight should be used whenever possible to determine the most appropriate FEA for a particular monitor.